BUSINESS: Australia’s Strategic Airlines is set to launch a new look under a new name in an effort to boost its position in the region’s low-cost carrier market. Air Australia is to become the new name and branding for Strategic Airlines. This computer graphic image shows one of the carrier’s A330-200s in Air Australia colours. The airline currently operates regular flights to Phuket and Bali from Melbourne and Brisbane, as well as servicing domestic routes in Australia. Soon to change its name to Air Australia, the airline will move to its new low-cost business model from October 30 and will boost the frequency on the Brisbane-Bali route, as well as services to Phuket from Brisbane and Melbourne. The airline is also set to launch a new livery for its aircraft under the rebranding campaign, featuring green, grey and gold with a stylised boomerang. “The new colours and logo convey a modern Australian aviation product, for a company with its own heritage and an instant sense of familiarity and like-ability. 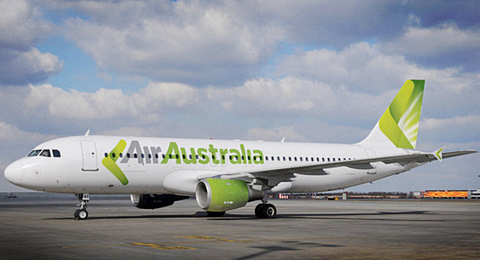 Green is our key color, with a hint of gold and subtle silver-grey representing gum trees, koalas and grey kangaroos,” said Sean Cummins, Executive Director of CumminsRoss, the company charged with overseeing the airline’s rebranding exercise. Strategic Airlines hit the headlines in June when about 300 passengers were left stranded in Phuket for several days due to ‘technical problems’ with aircraft. Strategic Aviation Group chief executive Michael James said the restructuring, which includes doubling the number of its pilots and aircraft, was timed to take advantage of changing demand for high value, low-cost travel while Qantas struggles with rising fuel prices and industrial disputes, and Tiger Airways attempts to regain market share after more than a month on the ground. “We see a very strong opportunity in the Australian market with Virgin changing its model to focus on corporate and higher-yield passengers, and a large segment of potential domestic and international travellers now somewhat unattended,” said Mr James.